Jean Michel Bruyère / LFKs "Le Préau d'un Seul"
"Step-Memories - Return of the Oppressed"
"F/T12 Jelinek Series: Rechnitz (Der Würgeengel)"
"F/T12 Jelinek Series: Kein Licht." Port B "Jelinek Series: Kein Licht Ⅱ"
marebito theater company "Record of a Journey to Antigone, and Its Performance"
It’s opening night of “Le Préau d’un Seul” (“One Man’s Prison Yard”), a site-specific theatre installation by French director and artist Jean Michel Bruyère and the international collective LFKs. I’m handed a map and directed down a grimy set of stairs. There is an electric whirring sound, something like a buzz saw. Is this the start of the show? Or just the typical sound of an old building? “Le Préau d’un Seul” is staged within the Nishi-Sugamo Arts Factory, which was, until 2001, a local junior high school. In 2004, it re-opened as a theatre space under the auspices of the non-profit organization Arts Network Japan. Plays are usually staged in the former gymnasium, while classrooms function as rehearsal rooms. “Le Préau d’un Seul”, however, sprawls over the whole building – the first event to do so here. Following the map, audience members go room by room, where they encounter a mix of art installation and performance. I enter one room, called the “Egging On Room” to see row after row of steel pots set on burners boiling eggs. Along one wall, cabinets hold neat lines of dozens of eggs, awaiting their fate or already having been boiled – it’s not clear. White tubing, which looks like the roots of some malicious, and enormous, alien species wrap around the table legs. Dry ice creates thick wafts of smoke. In the corner is a person, dressed head-to-toe in white, his (her?) face shielded by a white mask that protrudes over the lower face like a visor. I take a step. The person takes a step. Is he/she supposed to do that, as part of the performance? Or is he/she reacting to my presence, and possibly coming towards me? My heart speeds up just a little. Then, the person shuffles past me and out of the room. The feeling is not dissimilar to being in a haunted house, made all the more acute by the old, abandoned building, a soundtrack of whirrs, clangs and detached voices and the cold, sterile quality of the snow-white costumes. Yet “Le Préau d’un Seul” is most unsettling because of the sense of uncertainty it creates. The performers – in some rooms outnumbering audience members – may be moving along a set pattern or they may not be; this much is left ambiguous. 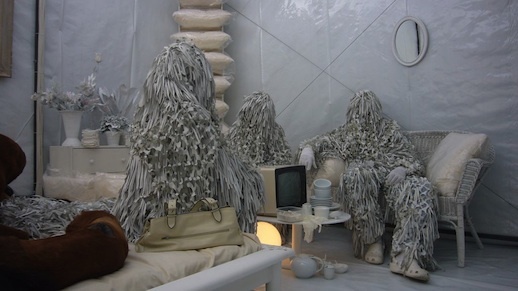 And what is the audience’s place in the installation? Are we performers, too, being observed by these masked figures, and each other? Or do they see through us as if it were us who were the ghosts? This uncertainty is most definitely deliberate. “Le Préau d’un Seul” is, thematically, about immigration. It is an artist’s rendering of an immigrant processing – or internment – camp, of which there are hundreds around Europe. In a later room, we meet the titular prisoner, a gaunt Senegalese man inside a long narrow tent staffed by more of the white-clad masked figures. His days are, we can imagine, a routine of uncertainty. The final scene is an installation titled “Le Chemin de Damastes” (The Path of Damastes), inspired by the Greek myth of the eponymous villain. The myth is a horrible one: Damastes was a blacksmith and a bandit who transformed a mundane object – an iron bed – into an instrument of terror. He invited passersby to sleep in his bed, then, in the event that they did not fit the bed (and they never fit), he adjusted them – stretching out those who were too short and, for those who were too long, amputating their limbs. It is a chilling analogy of the immigration process. The myth of Damastes also works as an analogy of the site-specific installation, something that has been in vogue in the art and theater worlds for a while now. 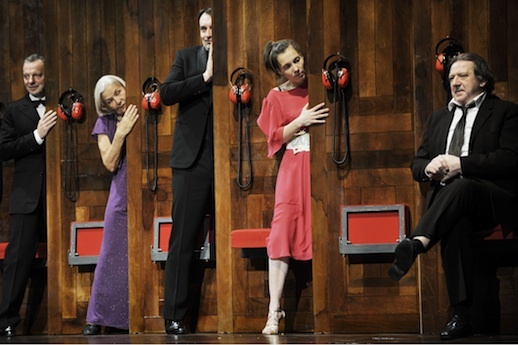 “Le Préau d’un Seul” made its debut at the Festival d’Avignon in 2009 and since then has played a number of theater festivals. 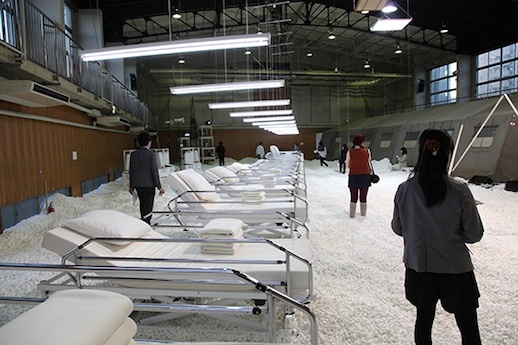 For its debut showing in Japan, the installation was “stretched” to fill the space of the Nishi-Sugamo Arts Factory. A few new sections were added, including the “Egging On Room”, which makes use of an old science lab. The central image – of the large immigration facility – remains very much European, but the setting is distinctly Japan: a school closed for lack of pupils, the result of both a low birthrate and a strict policy towards immigration. The neighborhood of Sugamo in particular is known for its aged, though spry, population. “Le Préau d’un Seul” is the opening work for this year’s Festival/Tokyo, the capital’s annual theatre festival, which takes place from October 27 to November 25 at several different venues. The politically and emotionally charged subject matter, as well as the demands the work makes on the audience, means it is a bold choice of programming. However, as the piece is essentially non-verbal, it functions as a neat, and literal, illustration of this year’s festival theme, “Beyond Words”. “Beyond Words” is one step removed from last year’s theme, “What can we say?” – both of which address post-3/11 Japan. Festival/Tokyo director Chiaki Soma explains, writing in the festival program, that a year and a half after the disaster left us temporarily speechless we are now in a space overrun by verbal noise – as journalists, politicians, so-called experts and activists all jockey for our attention and approval. Might theater, without surrendering its narrative quality, be able to cut through this din and express something different? In addition to a number of homegrown directors, the festival has assembled an international line-up whose entries, more often than not, examine real crises and tragedy, both widely and little known. “Rechnitz (Der Würgeengel)”, penned by the Austrian Nobel laureate Elfriede Jelinek and directed by Jossi Wieler, zeroes in on a highly disturbing event in Austria on the eve of the denouement of WWII. “Where were you on January 8th?” by award-winning Iranian playwright and director Amir Reza Koohestani addresses the protests in his country following the contested election in 2009. 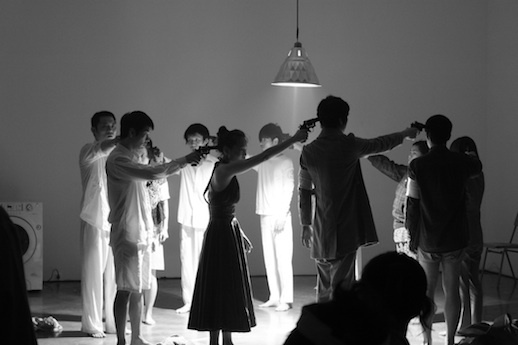 Towards the end of the festival, Korean director Hansol Yoon and his company greenpig will create a space for remembering the Korean War with “Step-Memories – Return of the Oppressed”. Like “Le Préau d’un Seul”, “Step-Memories” will take over the Nishi-Sugamo Arts Factory and ask audience members to journey through a site that, not entirely stripped of its own memories, serves as a canvas for new ones. It is a deep and heavy space the Festival Tokyo invites us to enter, but one where there is room to reflect, and to think.